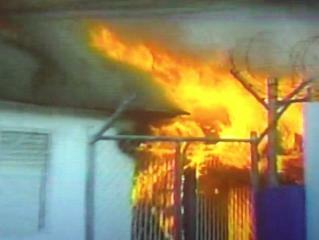 The Hannah Town police station, set ablaze by thugs thought to be allied to wanted man, Christopher 'Dudus' Coke. 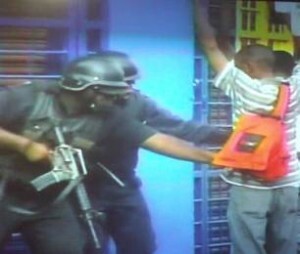 A state of emergency has been declared by the government in Kingston the Jamaican capital as gunmen attacked four police stations and burned one to the ground. The State of Emergency begins at 6 o’clock Sunday evening and last for a month. A statement from Prime Minister Bruce Golding said the decision to declare the emergency was based on the advice of the security forces. Gunmen supportive of Christopher ‘Dudus’ Coke, wanted by the US on charges of drugs and gun trading are resisting Golding’s decision to acquiesce and allow his extradition to face the charges. The men armed with high powered weapons attacked the police station in Hannah Town, a community near Tivoli Gardens where the supporters of Coke are ensconced, and burned it to the ground. A polioceman who was injured by the gunmen is admitted to hospital. News reports suggest they began their action after Jamaica Defence Force personnel began moving into the area near Tivoli which has barricaded itself in with debris including old vehicles, to prevent the apprehension of Coke. Police search youth in West Kingston, Sunday. A state of public emergency, limited to the parishes of Kingston and St. Andrew, has been declared and will come into effect at 6.00 P.M. today. In a statement issued this afternoon, Prime Minister Bruce Golding said that based on an update and advice from the security forces, he summoned an emergency meeting of the Cabinet at 2.00 P.M today to consider the advice. The Cabinet took the decision to advise the Governor-General to issue a Proclamation pursuant to Section 26 of the Constitution declaring that a state of public emergency exists in the parishes of Kingston and St. Andrew. The Proclamation shall remain in force for a period of one month unless extended by the House of Representatives or revoked earlier.